Pacific States University is college with 14 students located in Los Angeles, CA. Pacific States University has a long and distinguished history. 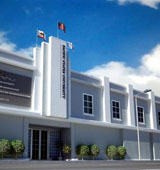 Founded in 1928 as an independent private institution, it has provided a comprehensive education in the fields of business, and computer science to more than 12,000 graduates. Located in Los Angeles it offers classroom and field-based learning opportunities designed to prepare students for preparation in their professional fields of choice. The student body, drawn from the United States and some 40 other countries, works together with a distinguished faculty, many of whom have international origins. Facilities include modern classrooms, computer laboratories with Internet access, and an extensive collection in the University Library which houses more than 15,000 volumes and subscribes to over 50 periodical, and professional journals. It provides a variety of computer services through its Internet terminals. Students have direct access to MELVYL, which is the online catalog network for the campuses of the University of California. Several other university libraries, as well as the Los Angeles Public Library, which is a major research facility make their materials available to students. PSU programs are uniquely suited for overseas students who can complete their degrees at a pace that fits their careers and personal schedules. Classes are offered during the day, in the evenings, and on Saturdays. Many students accelerate their course work by taking advantage of the summer quarter. Students will enjoy Southern California's yearlong outdoor living climate, remarkable especially for its sun-drenched winters. Oceans, mountains, and deserts supply a background of endless beauty in which to work, study, and play. A multi-cultural population lives, works, and dreams in the City of the Angels surrounded by smaller cities, suburbia, and rural California. Entertainment opportunities abound: many professional and collegiate sports teams, amusement parks like Disneyland, zoos with fabulous exhibits, a host of museums, many theaters and movie houses, symphony orchestras, opera companies and all kinds of contemporary music groups. The average student pays $30,753 for tuition, fees, and other expenses, after grants and scholarships. Total stated tuition is $18,740, in-state and on-campus, before financial aid. 100% of students graduated on time. Want more info about Pacific States University? Get free advice from education experts and Noodle community members.